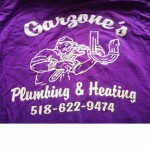 In 1990 Garzone Inc. Plumbing and Heating started serving the Greene County area with only two employees: Co-founders John Garzone Sr., and his wife Rae. Over the years the business has grown from one truck to seven. They handle all phases of plumbing and heating, service work, new construction, sewer and drain work, and utilize an underground camera.